Most hotels offer rooms for up to four guests, but what happens if you have a family of five or six (or more)? That’s the case for many, as well as multi-generational groups — a rising travel dynamic. If your family a hotel room for large families, here’s what to request and expect on your next vacation. These rooms are typically located directly next to each other, though sometimes they may be across the hall, as some hotels consider rooms following a number sequence adjoining. Adjoining rooms are rooms that require you to enter the hallway in order to get into the next room. These rooms have an interior door that leads from one room to another, meaning families don’t need to enter the hallway to enter one another’s room — perfect for keeping an eye on the kids while having separate bedrooms. Although the rooms connect, they are two separate rooms, meaning rates for two rooms will apply. Suites are another option for families, although some of them are actually just larger rooms with sitting areas, and rarely do they accommodate more than four guests. One-Bedroom Suites are similar in that they typically offer a king or queen bed in a separate sleeping space, plus a sofa bed in the living area. They may, however, be large enough to accommodate a rollaway bed or crib for an extra fee. Two-Bedroom Suites — generally found at luxury hotels — offer space for up to six guests, with two bedrooms to sleep four, as well as a sitting area with a sofa bed. 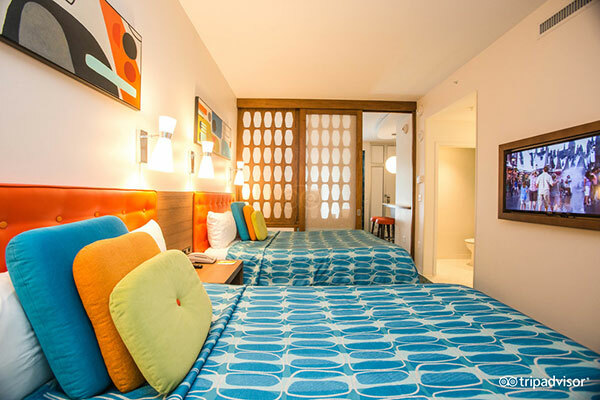 Better yet, more and more hotels, such as Universal’s Cabana Bay Beach Resort and Club Med Cancun Yucatan, are offering Family Suites. These include a separate room with one king or two queen beds, plus another room with two double beds or bunk beds (and usually 1.5 to two bathrooms). Family Suites typically accommodate six people. Another room type we’ve seen — family suites with three queen beds in one shared room, such as the Family Suite Three Queen at the Skyline Inn in Niagara Falls, Canada. 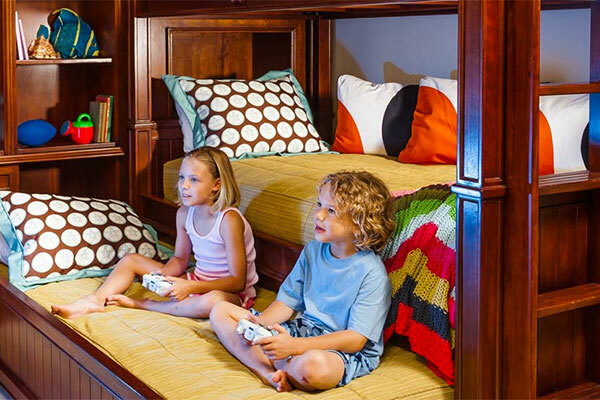 If your family books a suite that identifies how many people the room can accommodate, you will be guaranteed that space in advance. In other situations — if you request a connecting room, for example — that space might not be confirmed until you arrive. Some hotels offer guaranteed accommodations for a fee, while others, such as Orlando World Center Marriott and the Colonnade Hotel in Boston actually offer hotel promotions with connecting room guarantees. You can also secure a hotel for large families by choosing an all-suite property. Most major hotel brands have an all-suite sub-brand in the company that doesn’t even offer standard room options. Examples include Residence Inn by Marriott and Embassy Suites. These options may be easier on your wallet. Plus, they offer fantastic freebies, including breakfast. Destinations like Olympic National Park and Yellowstone National Park offer cabins, which frequently accommodate large groups. Lake Crescent Lodge, for example, offers cabins with space for up to six guests. 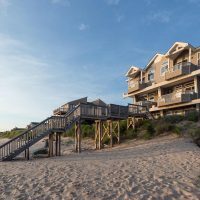 In Virginia Beach, many oceanfront hotels offer space for up to six guests; examples include Comfort Inn and Suites Virginia Beach Oceanfront and Springhill Suites Virginia Beach Oceanfront. Beaches Turks and Caicos has a multitude of accommodations for large groups, including Family Suites (located in the Italian Village) with one, two or three bedrooms. In the French Village, Concierge Suites can sleep up to 14 guests. Call the Hotel for Questions. It gives prospective or already booked guests the opportunity to ask questions pertinent to your family. Need another good reason to call? Calling to clarify and ask questions about the accommodations can get you out of something you don’t want after all. Consider Hostels. Family Vacation Critic reader Evan Fusco of Missouri says hostels work well for large families. “We found many youth hostels had either family rooms available or small dorms that you could reserve (i.e. six bunks) for a cost cheaper than a hotel.” Hostels are especially common in Europe, and often provide free breakfast and Wi-Fi.